I'm guessing it was unclear to others as well as me who was going to win the Heat. 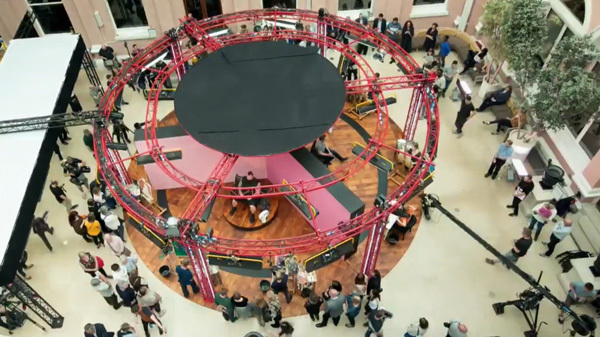 Unlike previous episodes where the shortlist could more or less be identified by how much camera time each artist got, this time it seemed the cameraman and/or Editor got somewhat distracted. who won the Heat and goes through to the Semi-Finals. More about the competition and the judges in my first blog post - listed at the end. The winner of the competition is commissioned to paint Tom Jones for the Museum of Wales. artists' social media accounts if I can find them online. Phillip Butah (Facebook | Twitter) - video - He doesn't like looking at eyes. Has painted Prince Charles - because he asked. Libby Fellingham (Facebook | Twitter) - video - trained as an architect with a First Class Degree at the Bartlett School, UCL and Diploma at Cambridge University. Based in Sussex. Tends to work with a palette knife from photos to produce portrait commissions of people, dogs and horses. 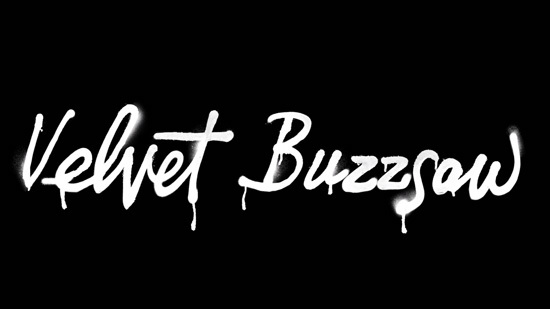 Milo Hartnoll (Twitter | Instagram) - video - a painter currently living and working in Brighton. Studied Illustration at The University of Brighton, graduating in 2013. The internet (but not the programme) suggests that in 2013 he was a finalist in Sky Arts TV Portrait Artist of the Year. He apparently does livestream painting on Instagram - which puzzled me given the speed with which he painted in the heat. Milo is a figurative painter who mixes classical and modern techniques. His work is process driven, searching for progression through a balance of control and chance. Michael Sheppard (Facebook | Instagram) - video - Graduated with a Fine Art Painting and Drawing degree from Northampton University in 2017 and subsequently an MA at Nottingham Trent University. He has autism and works in pen and ink and just switches off when he draws. Uses mj the art traveller as his brand name. I found this good interview with him. “I left university a much better artist,” he said. “The course gave me confidence in my ability. I was taught all the different ways and styles of drawing. We had lots of life drawing classes, workshops and studio time with our tutors and I was surprised to see what I was capable of creating. Robbie Stuart (Facebook | LinkedIn) - video - Graduated in 1993 from Duncan of Jordanstone College of Art Dundee with a BA (hons), Fine Art. Based in Walthamstow. Paints commissions and does arts and crafts workshops with adults and children. Sara Lavelle (Twitter | Instagram) - video - Foundation Diploma in Art and Design (Distinction) at Falmouth University and then went on to study Illustration BA (Hons) at the University of Brighton. As a final year graduate she had only recently taken up painting. Now based in London. Drawing upon a deep fascination with human psychology, philosophy and spirituality, my work has a predominant focus on portrait painting and figuration. I move freely between commissioned pieces and self initiated projects. I do wish they'd give us a much clearer view of all the self-portraits together. One gets a much better sense of who is the good painter. We need to see them from further away. I know the problems they have with the space - but they managed it in the last series but not in this one for some reason. On the whole the impression gained from the self-portraits was that this was a strong set of painters - with some who displayed some 'quirky' approaches to portrait painting. They all liked Megan's self-portrait - an artist painting herself as an artist. Sara's was much admired also - as was Libby's. 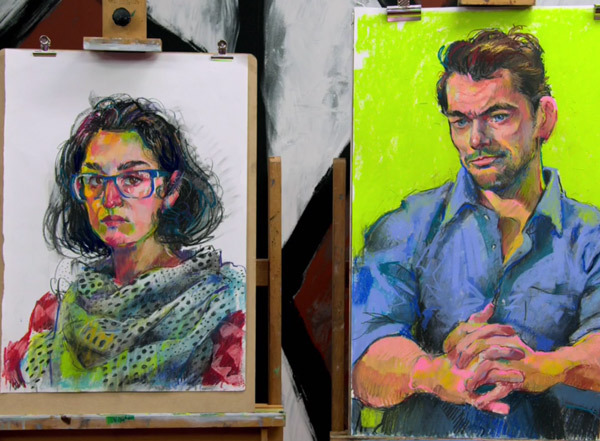 I had high hopes of Robbie Stuart and Mario Ramirez based on their self-portraits - however in the end there was an inconsistency between the self-portrait and the portrait painted in the heat. 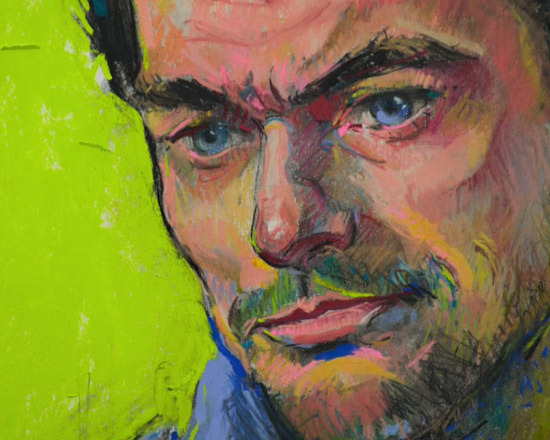 James Purefoy - an actor - and the most portrait sitter who moved least ever! Posted by Making A Mark on Wednesday, February 27, 2019 0 comments Who's linking to this post? I'm just going to take some selective comments from various reviews to give you an idea whether or not to start trying to find it on Netflix! 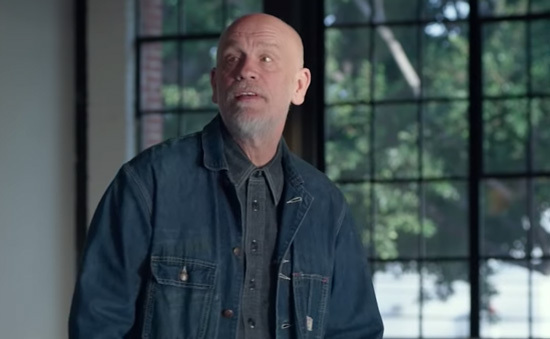 It's not a film to watch for the actors - although I did think a deadpan John Malkovich in a cameo role hit the nail on the literal (or metaphorical) head. Posted by Making A Mark on Monday, February 25, 2019 0 comments Who's linking to this post? "Anyone who can hold a pencil can learn to draw with some degree of proficiency"
Bert Dodson is a man who has a made a lot of difference to the lives of very many people who like to draw. My birthday wishes timeline on Facebook tells me that he turned 81 yesterday - and I'd like to wish him belatedly a very happy birthday. Reading his iconic art instruction book "Keys to Drawing" was one of those "lightbulb" moments for me and I've been recommending it to people ever since. Decades later, in an era when you go to the "Drawing"category of Amazon and all you can see are books about mindfulness, mandalas and colouring books (I despair - it makes me want to cry !!!) Keys for Drawing is still like a oasis in a desert of so-called art books by publishers who are more concerned with profit than providing decent learning opportunities. AND it continue to be have a lot of excellent tips on "how to draw"! Bert wrote to tell me that he really appreciated my book review of "Keys to Drawing"
I gather it generated a bit of a surge in sales afterwards! He now walks with an aid - and so do I - and that's because it's about twelve and half years since we last met and we now both wobble a bit from time to time! Long may people read his very sound advice on how to draw! Bert Dodson is a painter, teacher, author and illustrator. 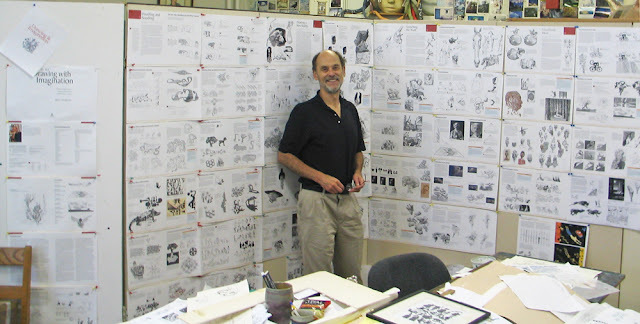 He has illustrated over 80 books for children. He has authored two books on drawing; Keys to Drawing (North Light, 1985), and Keys to Drawing with Imagination (North Light, 2006). In the 1980’s he created the political comic strip, Nuke, which was published in two volumes, as Nuke; A Book of Cartoons (McFarland and Company, Jeffersonville, NC, 1988 ), and Nuke II; Another Book of Cartoons (1990). He co-authored, with the biologist, Mahlon Hoagland, The Way Life Works ( Times Books, 1995), and Intimate Strangers; The Story of Unseen Life on Earth (ASM Press, 1999). He was animation designer for the four part PBS television series, Intimate Strangers (1998). He regularly exhibits his watercolors and drawings. I am an Amazon affiliate and all links to books include an affiliate link to my personal affiliate account. This means that if you buy a book as a result of clicking on one of these links I might earn a very small sum. Posted by Making A Mark on Sunday, February 24, 2019 0 comments Who's linking to this post? 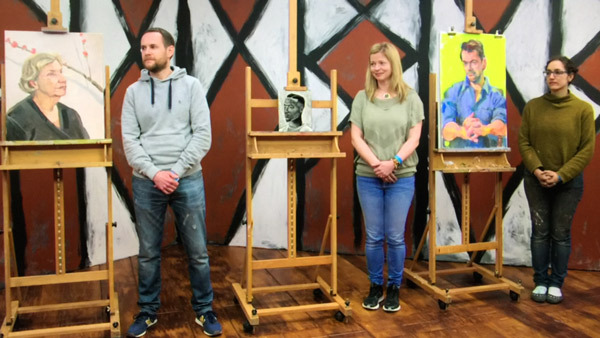 This week's episode of Sky Arts Portrait Artist of the Year 2019 has sparked a bit of a controversy online - of which more anon. Episodes 1 - 6 - Heats filmed at the Wallace Collection where the public can also watch. 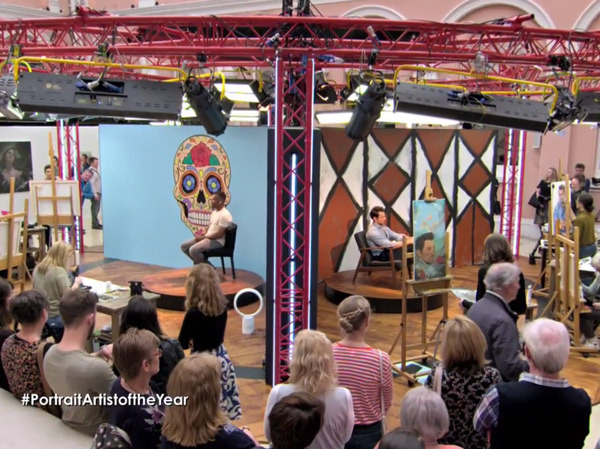 Episode 9 - A programme about "the artist of the year journey" and painting the commission. 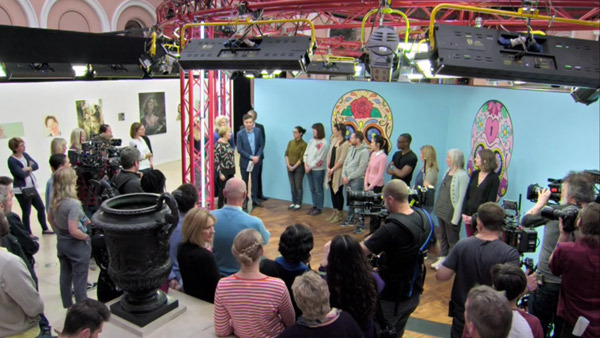 Life is being made "interesting" for me every week because I'm alway sat at the beginning of every episode waiting for one of the finalists to appear - because I know what they look like and how they paint - because I was at the final of this series at the NPG in June last year! You can view a Heat in person in the series which will be broadcast next year if you get yourself along to the BRAND NEW VENUE at Battersea Arts Centre from 2nd-12th April 2019 (not including the weekend). Doors will open to the public at 10am. Links to their social media accounts are also provided if sent to me in advance and/or I can find them online. Mainly because of them not getting proper credits in the programme! This episode we have 3 professional artists and 6 amateur artists. Who made it to the shortlist of three? Lindsey Gallacher (Facebook | Twitter | Instagram) - video - graduated (2000) with a First Class Hons. degree from Edinburgh College of Art in Jewellery and Silversmithing. She has a workshop in Swanson street, Thurso, Caithness (in Scotland). She's been creating contemporary jewellery and other forms of Art for 18 years. She describes herself as "a Caithness stone jewellery and scratch artist" but also confesses to being a total novice when it comes to using scratchboard for portraits. You can see more of her scratch art on her website. Hannah Shergold (Facebook | Twitter | Instagram) - video - Ex Army helicopter pilot (she used to fly a Lynx). 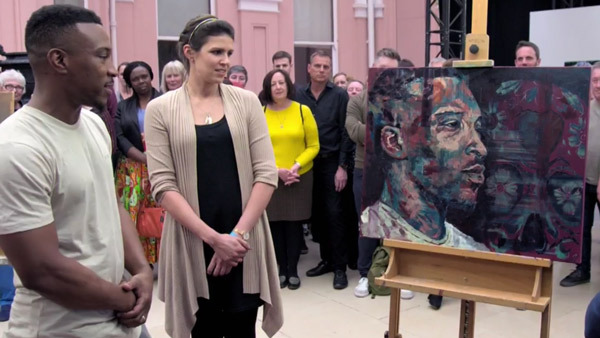 Wild Card winner of those artists invited to paint portraits from a screen at last year's final. Graduated from Cambridge University in 2006 having studied pre-clinical Veterinary Medicine and changed tack to establish herself as a highly respected bronze sculptor. 2009, she joined the Royal Military Academy Sandhurst and was commissioned into the Army Air Corps. Rachael Spain - video - Lives in East London and on a sabbatical from her financial services career in the City of London. No social media from what I can see. Beth Sparks [Instagram] - video - Lives in Bedfordshire and works in London as an Office Manager. Foundation Art & Design at the University of Northampton. The self-portraits on the wall had a variation this heat. 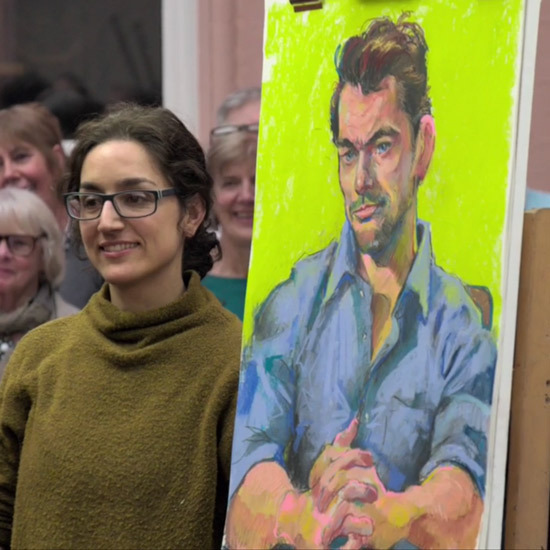 That's because the heat included Hannah Shergold who had been awarded a place on the strength of the portrait she produced in the final last year - while sat in a side room looking at a screen. The rest varied in size a lot as per normal. It's not coincidental that they are staring straight at the viewer - I'm seeing much more of the face and upper torso as a result. I'm finding the different art theme each week to be extremely tedious - and it's only week 2. 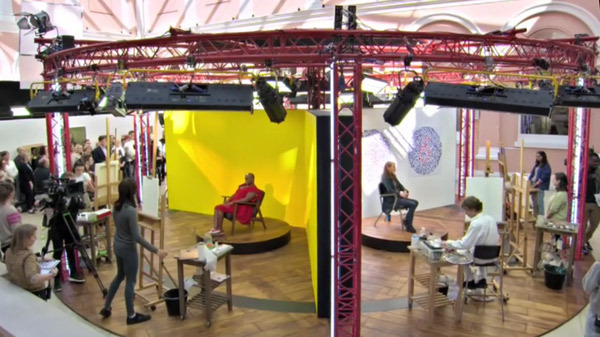 That's the limit of my comments on this "innovation" for this series - other than to ask whether the programme makers are seriously trying to distract the artists? are much more likely to get selected for the Heats. That is an official TIP from me. Imagine for example if every artist painted traditionally in watercolour or acrylic or oil how bored we would get. There seems to be a conscious effort by the programme makers to promote diversity in portraiture so people can appreciate the very many different ways of creating a portrait. This of course means that sometimes you get people using media which they are not necessarily very familiar with. Or they switch media once they've got into the Heat and ignore the fact that it was the use of a specific sort of media which got them there. Bottom line, from my perspective, I've not no objection whatsoever to the Judges seeking to vary what type of artists produce artwork each week. However we need to recognise that this can mean that we've got a lot of good painters of a certain sort - and they will only pick one of them. So if your portrait painting looks quite a lot like other people's portrait painting you might want to reflect on that. Speaking personally, as somebody who comments a lot on portraiture competitions and exhibitions, I don't call anybody a portrait artist if they can't paint most of the torso - INCLUDING HANDS. My definition of "can't paint hands" is that they have every opportunity to do so but choose not to. Kate commented to the effect that if done properly hands needs as much time and attention as the head. I totally agree. I'd go further and say that badly painted hands undermine the entire portrait. They are, if you like, the third leg of the trio of anatomical elements that can cause palpitations amongst portrait artists - eyes, mouth and hands. and if you win and you still haven't painted hands I still won't call you a portrait artist! Should a portrait artist paint what they see - or should they flatter their sitter? It's an eternal question and one which which is a challenge for every portrait artist. It's also a question that needs to be asked and answered before any artist starts a portrait. the older person has skin which sags and a skin colour which is different to a younger person. If you've not painted an older person before, the features which are characteristic of an older person may well not be present in your portrait. 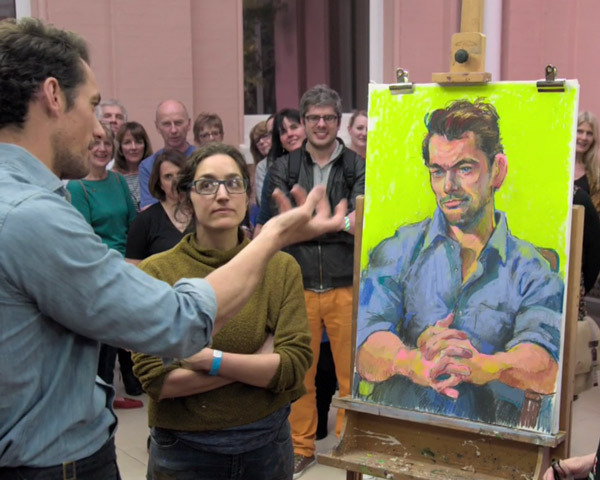 "I've just created a portrait of David Gandy and now he tells me why he likes it!" It wouldn't have been my shortlist - although Fátima would very definitely be on it. There was a mini Twitter viral storm in relation to the omission of Hannah Shergold from the shortlist - and I have to say I agree with them. I even did a mini poll on my Facebook page and the conclusion, after 163 votes were cast (although some were made in error where people clicked before reading) was that 83% thought Hannah should have been included in the shortlist. More importantly, what this tells us is that the Judges seem to be making a conscious effort NOT to put forward two similar artists from each Heat. They are trying to continue to promote diversity in approach and style - and media where possible. Which rather suggests that if you spot somebody who is similar to you painting in your Heat, you need to make sure that your two portraits are the best portraits if they get lined up next to one another. It also suggests that you can give yourself a really good head start by submitting the very best possible self-portrait you can do. I can understand what the Judges are doing and have some sympathy for it. I know for certain that if Fátima had not been in that Heat then Hannah's portrait would have definitely been on the shortlist and she may well have won. However I agree with the Judges that Fátima's pair of portraits were better - and I explain why below. Yet again I will remind readers that the decision is arrived at after reviewing both the initial portrait - and the portrait done in the Heat i.e. the decision is NOT made on the basis of the Heat Portrait alone. 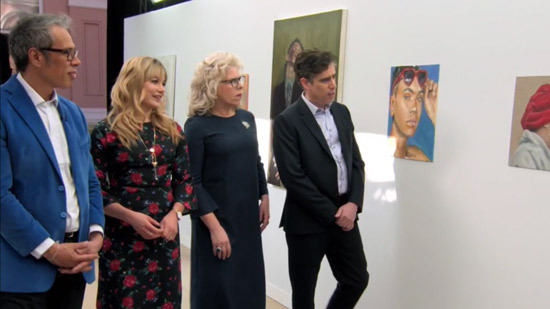 However - as I indicate above - I think the reason Hannah's portrait of Ashley wasn't on the shortlist was because Fatima's portrait of David was. despite nearly bringing the kitchen sink with her in terms of media options, Fátima persevered with the use of dry media (charcoal and then soft pastels) she started with and built on her good start rather than losing the both likeness and the impact and energy of her colour and mark-making as she progressed the portrait. This is how she painted it in pastels. For the record, I could certainly spot Unisons and and a few other brands. See what you can spot! Fatima Pantoja from Storyvault Films on Vimeo. PLUS below are my blog posts from last year which contains lots of learning points about painting in this competition for those aspiring to compete this year. Below are my PREVIOUS blog posts about the 2018 competition and my reviews of the heats, semi-finals and final - in which I comment on specific aspects for aspiring future contestants! Posted by Making A Mark on Thursday, February 21, 2019 0 comments Who's linking to this post? The website is a huge improvement and continues the upward trajectory of the SWA's performance in recent years. The History section in particular has been well researched and is very interesting. The society holds various exhibitions throughout the year, culminating in the annual exhibition at the Mall Galleries in London. The exhibition consists of works by members and non-members, which are selected by a panel from an open call for entries. The 158th Open Annual Exhibition will this year be held in the Main and North Galleries of the Mall galleries. Last year there were 448 artworks - paintings and drawings in all media, fine art prints and ceramics, sculpture & 3D works - across all three galleries - so I'd expect fewer works hung this year. Private View: 25th September, 10am to 8pm - the 158th Exhibition will be officially opened by Her Royal Highness Princess Michael of Kent on Wednesday, 25th September at 11am. 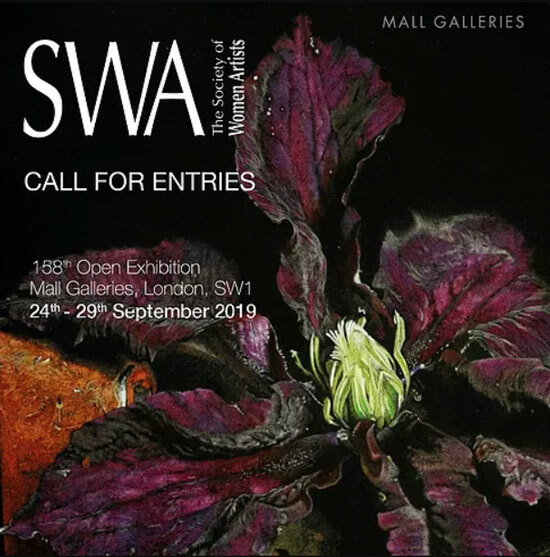 Entry is digital and the Deadline for Online Entries for the 2019 Annual Open Exhibition of the Society of Women Artists is Noon on 20th June 2019. Posted by Making A Mark on Tuesday, February 19, 2019 0 comments Who's linking to this post? One of the reasons I don't write every day for Making A Mark is because I've got other websites to look after. 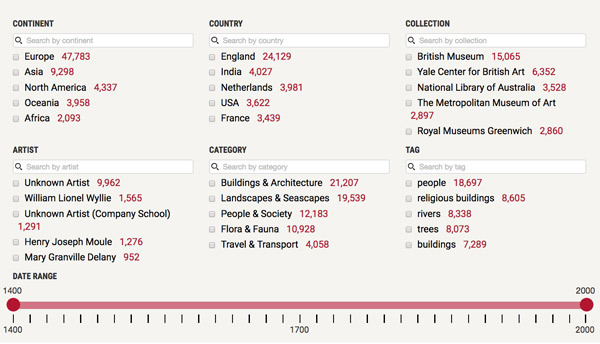 One of these - Botanical Art and Artists - celebrated one million visitors sometime earlier today! As I developed the site, I applied all the things I learned while developing Making A Mark. Consequently, it made one million visitors MUCH faster than Making A Mark! 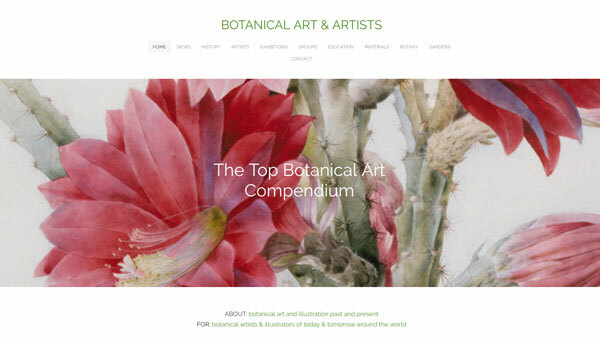 That means it's a site worth visiting, telling people about and coming back to - if you happen to be interested in botanical art! The website now has a global audience from every continent except Antarctica and is way out in front in terms of ranking on the first page of Google for a lot of very relevant search queries. The more niche your topic the more likely you are to attract visitors who want to find out more about it. By the same token if your art relates to an area which provides lots of competition, you're going to have to work harder to make your website stand out. Your site needs to niche enough to lose lots of competition and big enough to provide enough content to get lots of traffic. Traffic is important - because traffic begets traffic (i.e. people tell their friends). Once the traffic numbers start to climb you can keep them climbing if you keep doing the right things. Being very specific as to the topic of your page really helps a lot with attracting visitors. Think about when you are shopping for something online. Do you really start with a really generic term like "cars" or "paintings" or "watercolours"? Or do you get much more specific as to what you want eg "landscape watercolour paintings of the highlands of Scotland"
The search engines use WORDS to search and EACH page needs a title which explains precisely what it's about. No need to be coy or clever or too general - unless you don't want any traffic! 4. Provide a short summary of what each page contains at the top. If I get stuck I use the Google SERP Snippet Optimization Tool which really helps with keeping focused. Aim for about 120-130 characters. AND make sure that this correlates with what the meta description says! The trunk test for websites is the notion that somebody can pop you in the boot (trunk) of a car and drive you out to the middle of nowhere - and you'd be able to find your way home. However those that provide poor navigation or no indications of how to get back to the HOME PAGE will leave you forever in the limbo land desert. Complete the important bits first - and then develop your website over time - and keep developing it (or reworking it) - because Google hates a stale site! Think about ways to expand your content. I use Google Analytics and Statcounter and the stats from my webware provider. They all count in different ways. which pages do not get traffic - and then work out why. PS I don't believe social media numbers and that's because there are few ways of triangulating them. I think they tend to be haphazard at best given the number of tweaks per year the owners give their algorithms! I do believe my website stats - because they make sense once you factor in the different ways they count. 8. People look at images and read words - but really they scan both! If you don't give them enough images to look at or words to read then they'll depart fairly fast. You need to find ways of making images very easy to access, look good and yet not slow down your website. Personally speaking, I tend to aim for around about 100KB per image file but that's partly because I often have a lot of images on a page. You are at least as important as your art online - people want to know about you and to know about your art. Show them your expertise and write about it. Tell people about how you make your art. Seriously - it will make your website different from most! I linger longest on those websites where artists make their expertise accessible and informative. Show them images of your tools and materials and of you making art. Write in a relaxed and friendly way. Don't be stilted - except when you're providing instructions and need to be precise. Google really likes websites which are refreshed on a regular basis. check all pages on which you include items with date and make sure you update them as soon as an event is over. One of the excellent ways of doing this is to have a blog - and write regular blog posts. Remember they don't always need to be about your art - it can be about other art that interests you. Use social media to drive people to your website - whatever works for you and your customers / clients. So long as your links are seen as related in the eyes of Google, linking out is not a bad thing. Being a resource is in fact seen by Google as "a very good thing" - so be helpful! So if you consider yourself an expert at your particular form of art, it does you no harm to share and show off your expertise. Tell them about exhibitions you've enjoyed or galleries / suppliers / framers who have been helpful. It'll certainly make your website different to all those that have the identikit artists website I have to look at from time to time. Posted by Making A Mark on Monday, February 18, 2019 0 comments Who's linking to this post? There's a new website called Watercolour World which purports to be making images of watercolours around the world accessible to all. 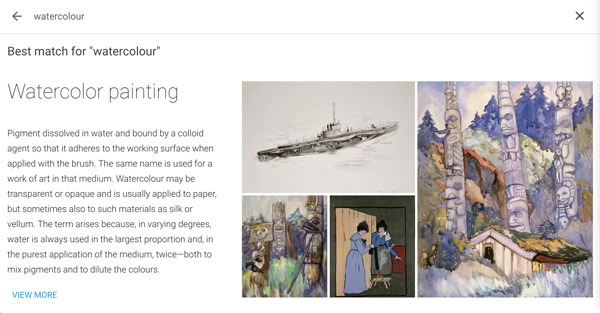 The Watercolour World (TWW) is a registered charity that is creating a digital database of all pre-1900 documentary watercolours in the western tradition. It forgets to mention in a prominent way - although it's there in the terms and conditions - that this is a "look but don't touch" website. That's because those involved with the project invariably make images of artwork available under an "all rights reserved" banner - despite the fact that the artwork has been out of copyright for very many years. The copyright in this instance relates to creating a digital copy of the work. A few - such as the British Museum - make their images available under a Creative Commons Attribution-NonCommercial-ShareAlike 4.0 International (CC BY-NC-SA 4.0) licence - which means they can be accessed by students and others learning about art for their school or college projects. It's also funded by a Foundation which has absolutely no cogent information on the Internet and no track record in terms of history of doing similar projects. One wonders who did the due diligence in the organisations that are co-operating. They certainly don't know how to look up records at the Charity Commission. 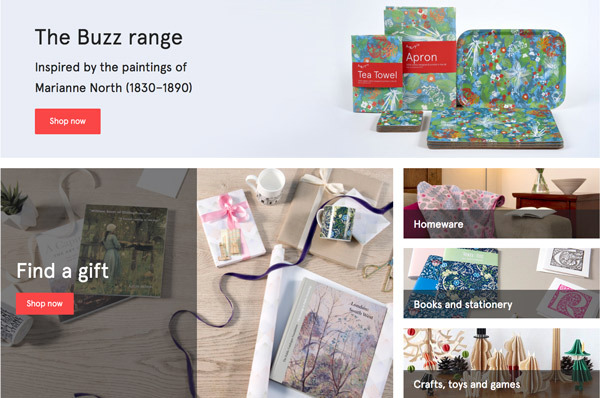 It's said to be operating under a similar model of operation to Art UK. Now I'm a fan of Art UK and one wonders why the watercolour exercise couldn't have joined it. It took over the project to put all the oil paintings online. It's also developed a nice sideline in selling prints of the artwork. I'm not convinced that this is the right way to make watercolours more accessible to all. a gigantic exercise in commoditization of the country's art collection - without any external accountability to those that actually own the artwork i.e. the country's taxpayers It's a way of putting less taxpayer's money into museums and art collections because of the income earned from sales - which is only generated if the artwork can be all over mugs and mousemats. It is in any case entirely pointless. I absolutely guarantee that before very long those who are completely besotted with Pinterest will be pinning away and losing the link to the original site - and ergo the copyright statement! More to the point, all those who also love selling prints online will have snaffled them and be selling them all over the place. Such individuals have never yet read copyright notices and I see no reason why they should start now. The thing is if all artworks which were out of copyright were made available online and accessible to all then the market for snaffling them would simply disappear. Plus they provide intelligent commentaries on mini projects. Plus the website is HUGELY more sophisticated. Now that's a real education! Posted by Making A Mark on Friday, February 15, 2019 0 comments Who's linking to this post? This time it's going to be rather more difficult because I already know which artists made the final - because I was there in the large gallery at the National Portrait Gallery where they filmed it back in June last year. Before I start I just want to note AGAIN that the people at the core of each programme - the artists - who really make it happen do NOT have any name credit at the end of the programme. This is just plain WRONG. Everybody else is completely superfluous without the artists! I'm pretty tired of seeing the various television companies make programmes involving people who have expertise without any credit whatsoever. .....and then the artists tackled the programme makers about this - and by the second episode they had their "name" credits on the programme! Like Arts and Crafts House, this programme includes professional artists who are a core part of the programme - not just an invited guest. If the BBC can make the change then so can Sky Arts! 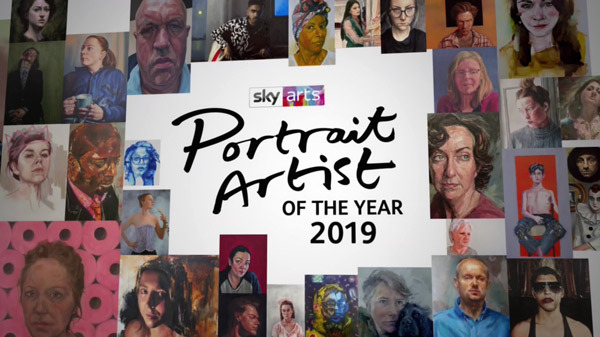 The Sky Arts Portrait Artist of the Year competition ranks alongside the other prestigious UK Art Competitions covered by this blog. That's because the artists are competing to win a £10,000 commission to paint Sir Tom Jones (the famous singer and all round British icon) for the Museum of Wales. 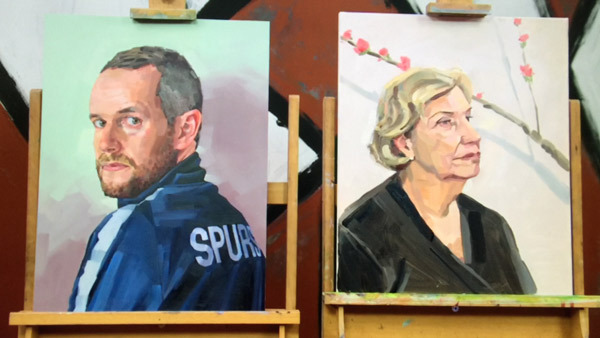 and this is the post I wrote for next year's competition - Call for Entries: Portrait Artist of the Year 2020 - which will be filmed in April 2019. Closing date is 12pm (midday) on Friday, 22nd February 2019. There are three well known sitters for each heat. British art historian, curator and arts broadcaster Kate Bryan. Those selected for the Heats came from nearly 2,000 applicants. We had major debates about the designation of artists during Landscape Artist of the Year. It turns out this is entirely down to the self-designation by the artist and is not verified in any way. Which is why very experienced artists who have sold over the years designate themselves as amateurs if their main income comes from another job. Also why students and new graduates who aspire to be professional artists but have very little experience and even less career success designate themselves as professionals. However there is no question that the artists are a mix of those with professional level skills while others are less proficient. Links to their social media accounts are also provided where I can find them. Mainly because of them not getting proper credits in the programme! Geoff Harrison (Portraits website | Facebook | Instagram | Twitter) - Stockport man (which greatly appealed to Stockport woman Joan Bakewell! Undergraduate degree in Fine Art Printmaking from the School of Art in Hull; lived in Japan for several years but now lives in London. He did an MA Japanese Studies at SOAS in 2009. Involved with anatomical painting and illustration and medical arts. Has had two residencies: Artist in Residence at Barts Pathology Museum at St. Bart's Hospital + Leverhulme residency at The Royal Veterinary College (see his paintings) He has also been shortlisted for the Royal Society of Portrait Painters' Bulldog Bursary and long-listed for the BP Portrait Award. He produces portraits on commission. Yevhen Nahirnyy (Facebook not a Page | ) age 19 but already taking commissions. One of the young artists taking part in the ‘In The Studio’ program with the Mall Galleries. Dorian Radu (Facebook | Instagram | Twitter) He has over 10 years of experience as a professional artis and has work selected for ROI exhibitions. He worn the he L. Cornelissen & Son Prize at the ROI 2017. Chris Williams (Facebook | Instagram | Twitter) a professional artist from Shropshire with a studio base in Hereford. She also paints landscapes and competed in Landscape Artist of the Year 2017 (the one with the big bridge). She exhibits about half a dozen times every year and is a regular exhibitor with the Royal Birmingham Society of Artists. Reoccurring in many of her paintings is the omittance of an eye, as described in the ancient proverb, ‘The eyes are the windows into the soul’. This phrase is crucial to her mentality as she grabbles to read and interpret her subjects. In her words, ‘People are a process, in which they slowly reveal and hide themselves’. Mike Tucker (Saatchi | Facebook | Instagram | Twitter) Fine Art graduate Aberystwyth University (BA) 2011 - 2014 Coleg Harlech (Foundation) 2010 - 2011. Lives in Hemel Hempstead in Hertfordshire and works in admin in the Prison Service. Uses Corpse Apple as his brand name. 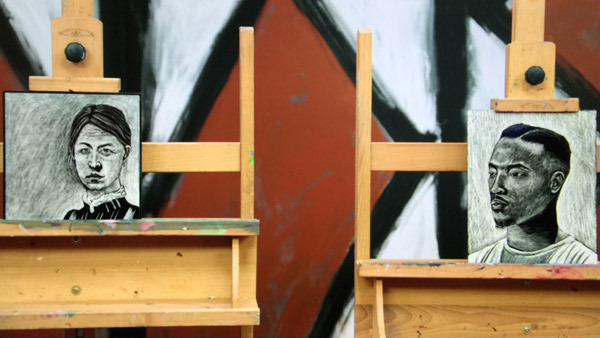 Eric Whitehead (Instagram) Studying a Foundation Course at London Fine Art Studios. Had never painted anybody from life before and had only ever done drawings from photos. Unsurprisingly he used his phone camera in the Heat. For me the self-portraits fell into two groups. Posted by Making A Mark on Wednesday, February 13, 2019 0 comments Who's linking to this post?